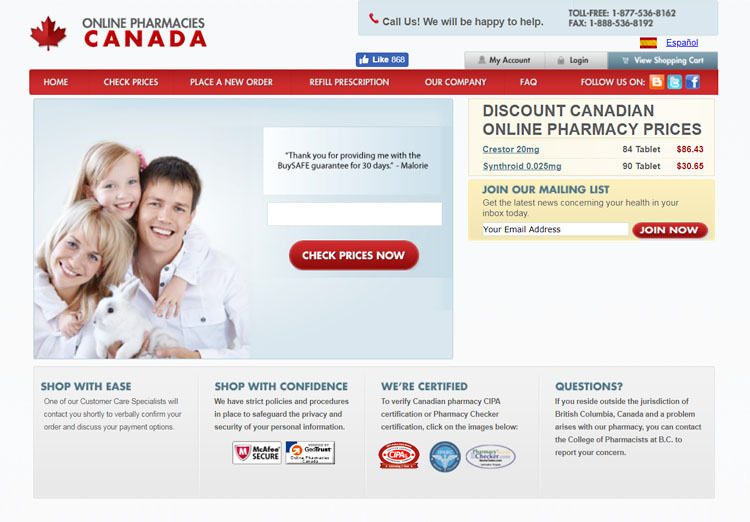 CanDrugstore.com is a Canadian pharmacy which says they’ve been in business since 2002. They have dispensed medication for over 1.000,000 prescriptions and promise savings of up to 80%. We look into the details of this drugstore to see if they live up to this hype and if you should consider using them. Business Name True North Management Inc. 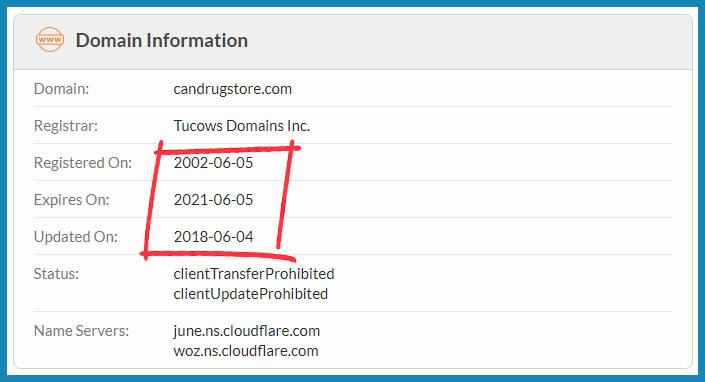 The domain name record for this online pharmacy shows us that they have been operating the site since 2002 as they’ve claimed. The address is registered until 2021 and both these factors would suggest that this is a more reliable pharmacy. Scam online pharmacies normally only register their name for one year at a time and don’t have such a long history as this store. Not quite as good as the long registration is the use of a privacy service to make sure the genuine contact information of whoever registered is kept out of the record. It is surprising to find details of ownership hidden with pharmacy site which has been around as long as this one. The web design of this store looks rather dated, perhaps not having changed the site for a number of years, if ever. The store is, however, secured with a valid SSL certificate to make sure your important financial information isn’t stolen when entering it on this site. Added security is provided by Norton. There is ID theft protection for up to $10,000, a purchase guarantee and another guarantee of lowest price. 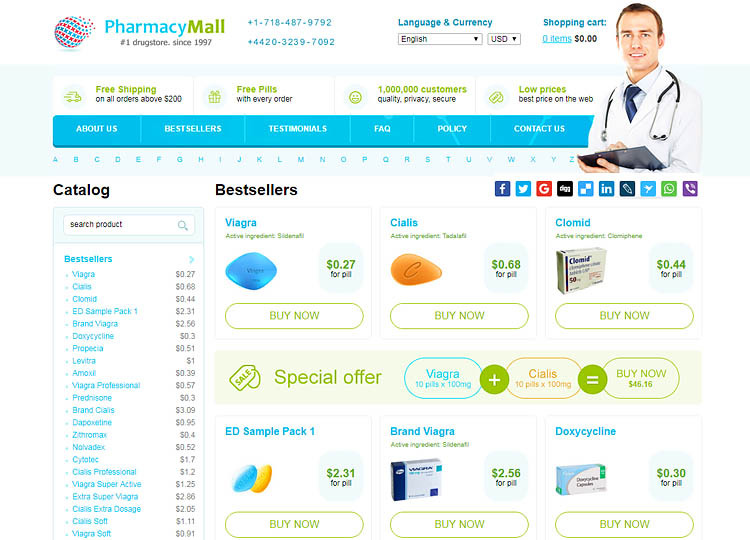 It can be reassuring to find a business name and address of where the online pharmacy is operated from. This pharmacy gives an address which is located in the York Centre in British Columbia, Canada. The Canadian dispensing drugstore is named ‘York Pharmacy’ is located right next door. Different countries have varying regulatory rules, and as this is a Canadian store we would expect them to be members of CIPA (the Canadian International Pharmacy Association). This site displays a number of accreditation seals, one of which is indeed for CIPA. A check on their database confirms they are members of this association and are allowed to display the seal. 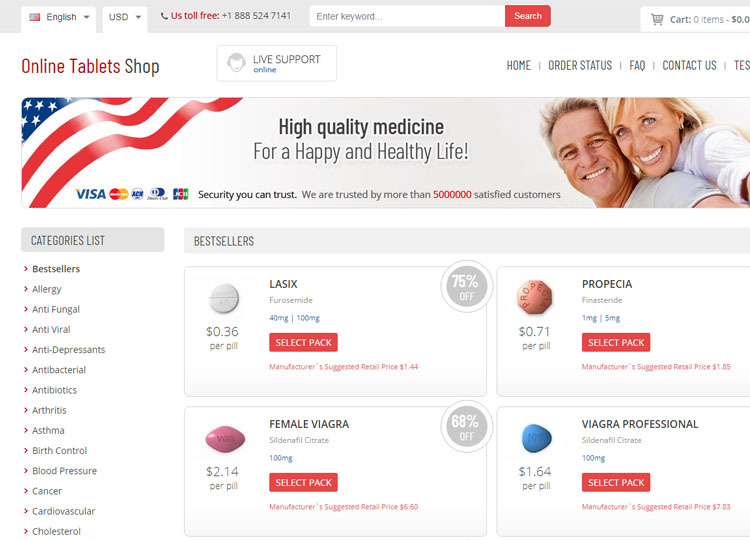 The store also claims approval from PharmacyChecker. A look on their website confirms that CanDrugstore is correctly claiming membership. The PharmacyChecker profile gives us some additional information about the business which we were unable to find on the store itself. It tells us that the name of the business behind the pharmacy is ‘True North Management Inc.’ based at the same address previously given. 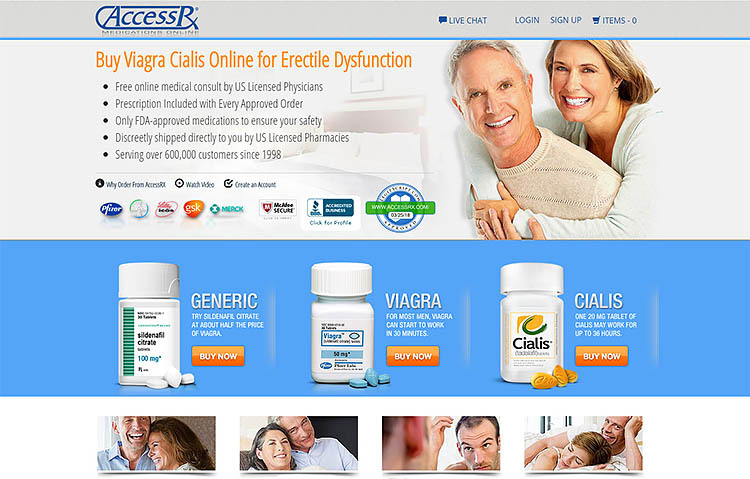 This online pharmacy has been reviewed by LegitScript and given the rating of an unapproved website. This isn’t as bad as it could be but it’s not a ringing endorsement either. CanDrugstore offers a good range of medical supplies including over the counter and prescription drugs as well as custom drug compounds and pet medicine. They sell brand-name drugs and the cheaper generic alternative. They dispense some of these products from the Canadian based pharmacy with the rest being supplied by international fulfillment centers and promise cheap prices when compared to other stores. The use of international fulfillment centers to dispense drugs can be of some concern. They do claim that these international pharmacies are correctly regulated in their own countries, but we are unable to verify this claim. The fulfillment centers are located in the following countries; Singapore, India, Mauritius, the USA, the UK and New Zealand. There has to be a suspicion that the use of international centers will inevitability increase the chances that fake and counterfeit drugs will enter their distribution system. This set up also increases the delivery time it takes for the drugs to reach you and this could be a factor in whether to use this store or not. You are required to provide a valid prescription when appropriate, this can be faxed to them, emailed or sent to their postal address. You may need to provide them with some background information as well, and a customer care specialist will phone you to confirm your order once these other steps have been completed. We haven’t been able to locate any coupons for CanDrugstore, unfortunately. 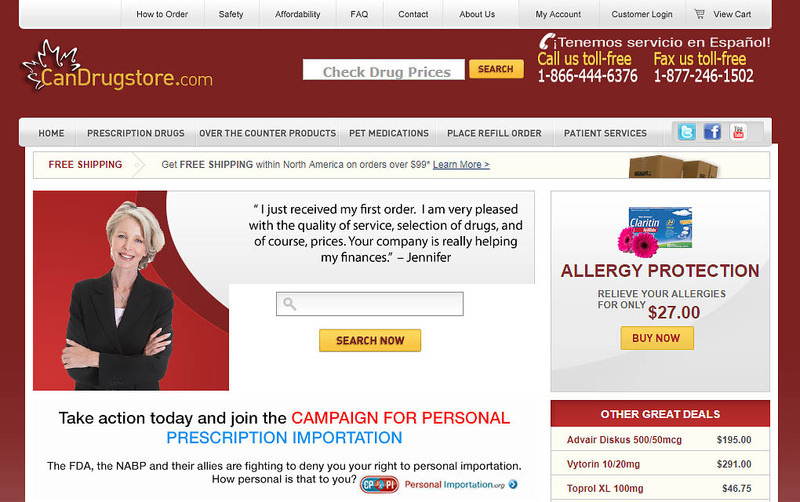 It is possible to pay for medication from this store using American Express, personal and certified checks, international money orders and e-checks. Delivery costs $9.95 and they only ship to addresses in North America. Delivery time is expected to be between 2 and 4 weeks. 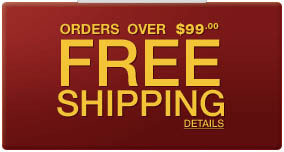 If you order products over the value of $99 delivery is free. The customer support options seem to be quite good from this pharmacy. They have a call center which is open 7 days a week and toll-free numbers to contact them. There is also an option to call a Spanish customer service representative. An online form can also be used as well as an email address or a mailing address. 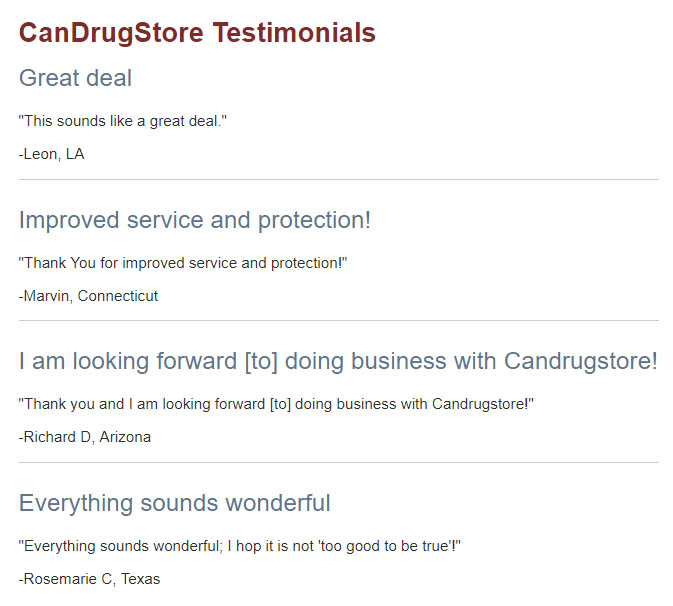 There are some CanDrugstore.com reviews to be found on the store’s own testimonial page. These reviews appear to be genuine but seem to be rather short extracts from longer comments. Customer testimonials which the store has cherry-picked to post to their site, aren’t going to give you an accurate perception of how customers really feel about this pharmacy. 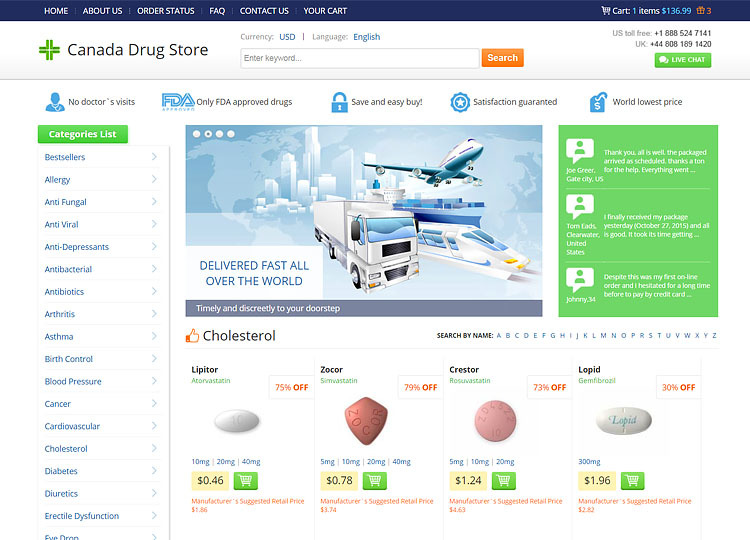 It is therefore good that some other and more substantial customer feedback is available on the PharmacyChecker site. These reviews date back to 2008 with customers rating the store either 4 or 5-stars. The comments seem to be genuine and from real customers but there aren’t too many of them. Bearing in mind that this store has been operating since 2002, they only have 9 customer testimonials on this site. This drugstore has lots of regulation, a wide range of products and good customer support going in its favor. The more negative aspects of their service are the use of international fulfillment centers with the consequently slow delivery time and their reluctance to reveal the ownership details of this store. We conclude that our mixed findings of this pharmacy are worth 3.7 stars out of 5 as an overall rating. We have some doubts about this pharmacy, better stores are available.